We've been waiting for this one for awhile! 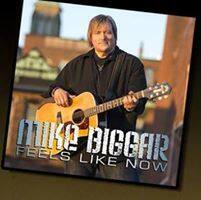 Mike Biggar's been teasing us for months, heck, a couple of years, anticipating his next release. It was 2010 when his first full album, The Season, was released. Trouble is, the Rothesay resident kept getting great results from that disc. First, he won the Music New Brunswick award in 2011 for best spiritual album, as it was a Christmas-themed album. Since that worked out well, the next year he took home an East Coast Music Award for Gospel Recording of the year. And you can't release a new album while you're still promoting the old one. They've stopped throwing awards at him, so Mike's new Feels Like Now is finally here. It's actually his first full-length disc of his country and rock style, and is quite a revelation. Everything that makes Mike Biggar a top talent is on display here. His song writing, his singing, his liveliness, and personality, they all shine through. It features 10 originals, half of them written by Mike himself, two with Canadian country star and fellow NB'er Chris Cummings, and three with the late Larry Wayne Clark, a proven country hit maker who died earlier this year, after returning to his home province. This all-New Brunswick song writing should not be taken lightly. Biggar and company came up with as strong a set of originals as any country album I've heard in awhile, and all home-brewed. The album has a strong variety, from touching ballads like Better Men, to up tempo rockers that sound like ready-made hits, such as June Night. One of the co-writes with Cummings is also a duet, called Lucky Stars. It's a strong mid-tempo number with a clever lyrics, and it's great to hear these two local boys together. If You Catch Hell is another rockier number, and that's where I like Biggar the best, he really sounds good with a big sound behind him, letting him stretch out with the vocals. That's the other major factor with this release, the singing. His vocals have always been a strong suit of his live or studio work, but now they jump out of the speakers. He seems to have found the eleven button on his vocal amp, and is now soaring, higher, louder, richer. He'll jump an octave and kick the rockers into high gear, or sooth you on the soft ones. This is where his personality comes through the most. He wrote these songs, he's invested in them, and really went for a full vocal performance on each one. Hearing him reach for the high notes is a real joy, because he hits them bang on, with lots of strength, and it's exciting. You're almost cheering him on. Oh, speaking of cheering him on, you can do that this weekend, at the official launch show for the new album. It's happening Friday night in Saint John, at Mexicali Rosa's at 9 PM. It's a free show, with copies of the new album on display and on sale for the first time. Mike's going to be appearing with his full band, and a special surprise guest too. This is an outdoor show too, because it's happening on the new courtyard patio there, so there's a rain date of Saturday if one of our frequent storms blows in.